While browsing through the racks of used DVDs at Amoeba Music in Hollywood earlier today (in the horror section, natch), I came across a movie I haven't seen -- or thought about, really -- since the mid-80s. 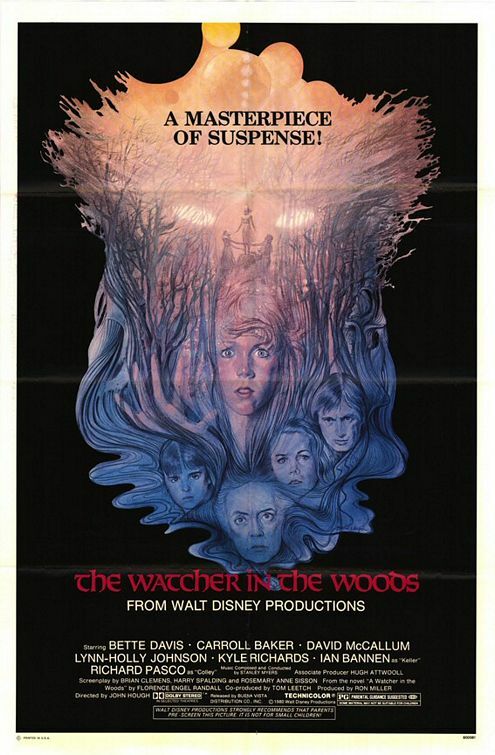 The Watcher in the Woods is a 1980 Disney flick (Disney!) about the spirit of a dead girl haunting a young teen at her family's British countryside home. Starring Bette Davis in one of her final roles, the melodramatic movie also features Carroll Baker, the gun-toting grandmother from Kindergarten Cop (all together now: "You're not so tough without your car, are ya?"). To think that the studio that gave us the Happiest Place On Earth also produced a straight-up supernatural thriller without any comic relief or blatant product placement is mind-boggling today (granted, it was rated PG). If I were to make an analogy? It's like if Disney had released Insidious two years ago. I must have been 4- or 5-years-old when I saw this movie for the first time. The eerie imagery (a blindfolded little girl, occult rituals, and Bette Davis) left an impression on me. I doubt the movie holds up well 33 years later in a world inundated with fare like Paranormal Activity and The Conjuring bringing on the scares. But still, I plan to revisit and rewatch. 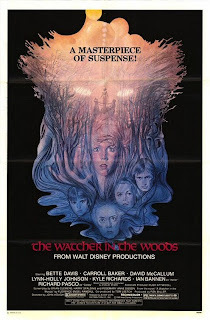 On the last day of fourth grade, the teacher showed us The Watcher in the Woods. The following Halloween, the fifth grade teacher showed it to us. They said that it was an acceptable horror movie for school because it didn't contain violence. Personally, I prefer the REAL kinds of horror flicks. Still, that scene where Jan almost drowns is enough to unnerve anyone.